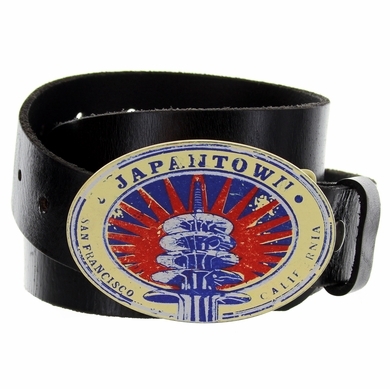 Cool JapanTown-San Francisco, California buckle with sleek graphic print. The Peace Pagoda designed by Japanese architect Yoshiro Taniguchi is the center-focus of this masterpiece. The peace monument stands today in Nihonmachi(Japantown) as an inspiration for peace. Genuine 100% leather belt will show off this masterpiece for years to come. Buckle is interchangeable with any that accepts 1.5"(38mm) belt. Buckle size approx. : 3.5" x 2.5". Measure around where you wear the belt and order that size.